Energy-conservative high school student Houtarou Oreki ends up with more than he bargained for when he signs up for the Classics Club at his sister's behest—especially when he realizes how deep-rooted the club's history really is. Begrudgingly, Oreki is dragged into an investigation concerning the 45-year-old mystery that surrounds the club room. The first episode received an early screening at a special event held at Kadokawa Cinema Shinjuku on April 14, 2012. The regular TV broadcast started on April 23, 2012. "I don't do anything I don't have to. What I have to do, I do quickly." For most people, the short years spent in highschool are often the turning point and highlight of their lives; a time filled with introspection and change, where some dreams end and others are born to take their place. On the other hand, there are some who reject this notion and choose to spend their days as uneventfully and routinely as possible, never straying too far from their comfort zone and established lifestyle. After all, why waste the energy on trivial matters? Oreki Houtarou is one of these individuals. Set during the dull and grey life of Oreki's first year in highschool, the story begins with an important change to his individual status quo — the joining of the school's Classics Club, albeit out of obligation rather than choice. Receiving a letter from his older sister asking him to join the club to keep it from being disbanded from lack of membership, he solemnly accepts his duties and sends in a club registration form, which appropriately causes surprise for his close friend Satoshi. For an individual uninterested by studying, sports, and socalizing, joining a club can be an arduous and painful ordeal. And indeed, if not for a certain girl immediately joining the club, Oreki could very well have maintained his status quo of living dully and freely. But perhaps change isn't always a bad thing. This changing force is Chitanda Eru, serving as the contrast to Oreki's behavior. Shortly after their first exchange, Chitanda drives Oreki into a set of mysteries involving the club and its later two members, a repeated occurence often instigated by her eyes lighting in excitement and being followed by her catchphrase, "I can't stop thinking about it!". These mysteries are what form the bread and butter of the story, so it's a fortunate thing then that the mysteries themselves are varied; involving fairly interesting situations such as a room being locked or ghost sightings during a hot springs trip, and trivial events such as why a student was suddenly called to the office after school. No two mysteries are the same, and while several of the episodes are independent stories, three distinct arcs constitute the bulk of the episodes and the development of the characters. Fortunately (and not so fortunately) the fairly lighthearted formula established in the self-contained stories is mostly reversed into something more dramatic and serious in the main story arcs once things finally get heated. It provides a refreshing contrast between the two and prevents things from feeling too repetitive or stale. Problems unfortunately come as a result with this change in tone, however. The dialogue can sometimes come across as being cheesy with overdramatized and exaggerated reactions to some of the events, such as Chitanda gasping in shock like the world has just ended when a book is missing from the clubroom, Oreki yelling and giving a death glare when his senior manipulates him a little bit, or the other three members of the Classics Club treating Oreki as some kind of savant for solving what are often very simple mysteries. Considering the trivial and often lighthearted nature of these mysteries, the overdramatization in the script is something that stands out as being very inconsistent with the overall tone of the series. Another flaw exists with the mysteries themselves, and those watching the series primarily for that aspect are very likely to find themselves disappointed or bored, especially with the self-contained stories whose mysteries are often so trivial and juvenile that they are more equivalent to a curious question than anything else. They lack the depth necessary to truly become something well-written and engaging, and have very little in common with the mystery novels that the anime frequently references. Though these mysteries don't qualify as being bad, they're mostly mediocre and certainly don't stand well on their own. 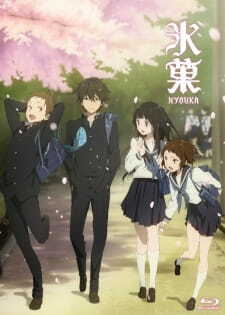 Instead, much of the appeal and enjoyment of Hyouka comes from the relationship between the characters and their interactions with one another. Similar to the dynamic between Sherlock Holmes and Watson, three of the main characters in Hyouka each fill a specific role in the club: Chitanda instigates the mystery, Satoshi provides information, and Oreki deduces. While the early episodes may give an impression of this being formulaic, the characters soon break from the mold and begin to do things that don't strictly pertain to their accepted role and behavior. For example, Oreki may decide to instigate the mystery himself or in one specific case Satoshi attempts to be the one to unravel and deduce. One main character even ends up being the culprit in one episode which makes for a fairly surprising conclusion. Luckily, there's enough substance to their interactions that they come across as normal human beings rather than simple stereotypes, though Chitanda's eccentric traits and curiosity are often exaggerated for comedic effect. The characters all show a wide spectrum of emotion and get disappointed or angry depending on the situation (despite problems with the aforementioned overdramatization) or joke around and playfully criticize one another when things are going well. What mainly shines, though, is Oreki's and Chitanda's relationship, stemming from how heavily their personalities and behavior contrast with each other. Seeing him react and deal with her curious and capricious behavior always makes for some endearing and amusing scenes, with blushing and romantic moments abound. Then again, none of this would be very interesting in the first place if these characters didn't stand out by themselves or possess any distinguishing qualities. It's thanks to the writers' aptitude that the main characters undergo a considerable amount of development over the course of the series, resulting in something that is fundamentally more complex and dynamic. The majority of this development is focused on the protagonist, Oreki, as his dull life slowly changes into something more colorful and vibrant. At the start he's very reluctant to expend energy on anything that isn't absolutely necessary which is what causes him to repeatedly rebuke Chitanda for roping him into these situations. Mainly a result of the enjoyable time he has with Chitanda and the Classics Club, Oreki begins to realize that being involved and competent with something might not be such a bad thing after all. He starts to willingly pursue these mysteries through his own effort and curiosity, without the need of Chitanda urging him to investigate. For a person so bent on doing nothing with his days and conserving all time and energy possible, it's only natural for the rest of the club members to point out his change in behavior. Change isn't only evident in Oreki, though, as Chitanda, Satoshi, and Mayaka also experience it to varying extents. In particular, Satoshi — often serving as the comic relief — becomes unsatisfied with his role and lack of recognition in comparison to Oreki. For several episodes he trails off into the mystery by himself in a mostly unsuccesful effort to duplicate or better Oreki's deductive skills. The jealousy being portrayed in some scenes is a somewhat unneeded and perhaps cliche, but this arc in the story provides a pleasant change to Satoshi's character and is successful in fleshing him out much more than in the early episodes. The second-to-last episode takes this further as well with even Satoshi understanding his change and becoming happy with his new lifestyle. Mayaka also gets some much needed screentime during the third arc which involves her status in the Manga Society club and her relationship with its members, with the outcome of this sidestory being something fairly satisfying and conclusive. Chitanda on the other hand changes surprisingly little over the course of the series though perhaps it's for the best. After all, she fills a necessary and important role in the story as the foil of Oreki and catalyst for his change and development. If Chitanda wasn't her usual self, where would Oreki be? Now, there's one thing that can be agreed upon in regards to Hyouka, and that is that Kyoto Animation has made this show absolutely stunning visually. The presentation of Hyouka is one of the most outstanding aspects about the series. Mood and atmosphere is set by the prominent lighting and by the events and monologues which are heavily stylistic and surprisingly abstract at times, occasionally taking the viewer away from the normality of the situation and into a place much more surreal. There's a distinct visual element present in Oreki's thought process with the layer of each mystery being carefully mapped out to the viewer, which serves not only to make the mystery more clear but to provide a much more immersive experience than the characters simply speaking to each other. Some scenes also possess a very dreamlike quality, with a couple particular examples including Chitanda's first inquisitive moment which succeeds in captivating Oreki or the dozens of little curious Chitandas crawling and tugging on him in the sixth episode. This type of dichotomy between the normal and the abstract is what makes Hyouka a very unique experience. The underlying animation and designs are also phenomenal. KyoAni has long been lauded for the standard of detail and animation set in their works and this is taken even further with Hyouka, with the entirety of the anime feeling very much movie-quality throughout of all its episodes. The realistic and lifelike movements of the characters is praiseworthy but what stands out most is the focus on eyes and facial expressions. The characters of Hyouka are easily some of the most visually expressive seen in an anime for quite some time. Even the side or background characters receive much of the same detail to animation and character design, making nobody seem bland or the derivative of another. It's surprising then that KyoAni managed to keep to this level of quality for all 22 episodes, with no noticeable decrease visual nor artistic quality. The seemingly limitless attention to detail here is really something commendable. But it's not all about visuals technically, either. Hyouka boasts a very fitting and eloquent soundtrack that accentuates the atmosphere set by the visual design. Composed mostly of classical tunes and eerie or quizzical melodies, the music is what creates the inherent sense of intrigue within Hyouka. It perfectly manages to capture the principal feeling of mystery in both the relaxed and dramatic moments of the series, never feeling overbearing nor out of place. In the end, Hyouka does fall short of some of its potential due to issues with the script, but what the anime lacks in mysteries it more than makes up for with its characterization and presentation. It's just a bit of a shame that many people will choose to write the anime off and treat it as something weak and disappointing because the mystery aspect didn't hold up to their expectations. A misconception exists where people treat Hyouka as a strictly mystery title, and while it does hold true to some extent, these mysteries are instead used to develop the characters and have them interact in a remarkable manner, distinctive manner. This is an anime that essentially amounts to mundane events presented in a stylized and intriguing way. For those looking for something fresh in an age of uninspired rom-coms and homogeneity, Hyouka is a title that is easily worth your attention. There's this sweeping notion that deep and action-oriented storytelling is necessary for a quality experience, but titles like Hyouka can safely disprove that line of thought. Mod Edit: Review may contain spoilers. Alright folks, let's talk some Hyouka. Time to exercise your brains and turn that curiosity light bulb ON. Hyouka (also the same name of the first volume of the Classic Literature Club that's also a implied term of “Ice Cream”) is an anime series adapted from the mystery novel written by Honobu Yonezawa. The story? Well, if you're curious like a certain purple eyed girl in the series, Hyouka details the Kamiyama High School's Classic Literature Club and its members having fun while solving mysteries and enjoying the time of their boring lives. It all begins with the unenthusiastic young boy by the name of Oreki Houtarou. He is the type of guy that is hard to make friends with because Oreki in his minds and his friend describes him as someone who is not keen in joining clubs, play sports, or socializing. Despite this, he is very intelligent and observant of the tinest events as well as having an insightful intuition. After joining the club reluctantly by his elder sister, the mysteries, fun and, Hyouka stories begin. Of course, Hyouka wouldn't be much fun without the other members of the club, right? We have the calm and happy girl with the keen curiosity. With those large purple moe eyes, she is curious about various events and mysteries that often involves others and goes “watashi kininarimasu!” (I'm curious!). She is a fun and happy go girl who despite being annoying at times brings the fun and entertainment in the story. On other hand, there's her best friend Mayaka Ibara who calls her affectionately “Chi-chan”. Mayaka is sort of the opposite of Chi-chan as she seems to be the type of girl who wants to avoid confrontations and if possible, end it as peacefully and swiftly as possible. Last but certainly not least is Satoshi Fukube. He's the happy guy who is carefree about life but deep down a great guy as he cares about others' well being. With a powerful memory, he is a useful as well as a compatible partner of Oreki who balances out the cheerfulness and moody mood of the duo/club. Now at this point, you might be as curious as Eru Chitanda herself or even had a thought of “watashi kininarimasu!” on whether the series is worth to watch. Overall, the arcs and story is well crafted. Detection fiction stories involving a group of friends is never new in the anime industry. Series such as Detective School Q, Heaven's Memo Pad, and Spiral: The Bonds of Reasoning also have such elements. What makes the series more interesting seems to be the interactions between the four main members of the club with each other that goes beyond the typical mysteries. The actors plays their roles well with their voice acting that reflects the personalities of the characters. With nearly all the characters having different characteristics, it's amusing to see how they all get along in the club. Surprisingly though, it actually does work well. But of course adaptation an anime always has its problems of the script not flowing or losing its touch in some of the filler like episodes. Personally though, it works out fine. Because the series takes place at a school life setting, there are other characters in Hyouka that interacts with the club. These are often included in some of the mysteries and requires the clubs' various skills to crack that case. If animation was part of a popularity poll this year, Hyouka would take the grand prize. Kyoto Animation (Clannad, K-On!, The Melancholy of Haruhi Suzumiya) does a pretty damn good job with its production quality and that's not an understatement. I remember watching the first episode and the first thing that popped into my mind was “wow, that animation is out of this world!” No but seriously, the production quality is top notch and Kyoto Animation does not disappoint. It even includes word play illustrated in the minds of Oreki and some of the other characters during cases to depict clues in a more realistic way of telling the story. With its gorgeous artwork and beautiful style of presenting the characters, it goes on without say that “a picture is worth a thousand words”. The soundtrack of the series is smooth that is well coordinated. When a mystery case scene is presented, the soundtrack flows. When a comedy scene (usually involving our curious girl Eru Chitanda), an OST of rhythm is played. Even when Oreki is bored, it shows that he really is bored through the soundtrack. Talk about unenthusiastic. The two opening songs are also well orchestrated in the series. The first OP song, "Yasashisa no Riyuu" by Choucho presents a smooth flowing song that gives us a lighthearted feeling of Hyouka. The second OP song "Mikansei Stride” by Saori Kodama presents a more humorous way of the series with Oreki peeking around with curiosity himself. (somewhat similar to Medaka Box's Opening). And of course, the ED songs are also there to make us feel the mystery. Well, not exactly. The first ED song seems to be quite naughty to say the least. Chitanda and Mayaka in those curious positions?! Turn that imagination bulb ON. The second ED song though fits more within the mystery genre and is generally entertaining to watch. Overall, Hyouka is one of those lighthearted series to watch by the end of a long weekend. The series does have flaws such as the the repetition in some of the intertwined arcs as well as mindless word plays that goes on in some episodes that can be bothersome to watch. Chitanda's signature phrase “watashi kininarimasu!” is also infectious at times and gets annoying. Additionally, some of the mysteries are a bit dull and not realistic as it seems. If it's a real mystery, why not involve some real murders and crimes? Needless to say, it's why Hyouka is rated PG-13. Hyouka is a school mystery series that involves...guess what, mysteries. If you're not into detective fiction or that sort of genre, then hit that drop button. No one is stopping you. But if you're curious like Eru Chitanda, then sit back, relax, and watch some mysteries as well as the members of the Classic Literature Club do what they do best at. Curiosity kills the cat but Hyouka is what kills the boredom. "I'm curious; I can't stop thinking about it!" Are you looking for an adrenaline pumping mystery anime about murders,deception, and crime? Are you looking for a mystery anime that has a badass detective? Are you looking for a mystery that will keep you on the edge of your seat? Well look somewhere else. Because Hyouka isn't that kind of anime. Story-Hyouka revolves around a boy called Oreki Houtarou. An apathetic guy who has little interest in anything or anyone. His life motto is "I don't do anything I don't have to. What I have to do, I do quickly." But when her older sister who lives in india sends him a request to join the classical club to keep it from being shut down. He accepts, thinking that the club could be a good place to stay alone and conserve his energy. But his conservative life is in trouble as he finds out that the club is also occupied by A curious girl by the name by Chitanda Eru. Overall, the story and mysteries for this anime are well crafted. Most of the mysteries were interesting and enjoyable.But sadly, A few of the mysteries were poorly made and downright boring. Luckily, these mysteries are only a few and were rather short. There is also a good bit of romance and comedy in this anime. Art- Kyoto Animation is always praised for it's good art and animation. But Kyoto Animation decided to take Hyouka to another level in art. Hyouka is by far one of the most beautiful animes I've ever seen. The characters design is designed so well and fit with their personality almost perfectly. The backgrounds were created with such detail that it felt like I was watching an anime movie instead of a tv show. Movements are also fluid and small details like the wind blowing the character's hair is also greatly done. Sound- The soundtrack fits the anime perfectly. From comedy to drama to the start of the mystery the soundtrack fits the mood perfectly and only brings more enjoyment to the viewer. The first and second openings are also great songs that went on my ipod after first listening to it. The two endings are also quite good for endings and I enjoyed them. Character- Now the true reason this anime is so enjoyable is not only because of the mysteries.But also character interaction. In this anime we have four main characters. Oreki Houtarou, Chitanda Eru,Satoshi Fukube, and Mayaka Ibara. Three of the four people have different roles in solving a mystery. Satoshi is the database.Chitanda is the person who raises the question and opens the mystery, and Oreki is the person who solves the mystery. But these roles do change at times. Sometimes Satoshi would be the one to try and deduce the mystery, and Oreki would raise the question himself. Each character also goes through character development through the anime. Especially Houtarou. He develops to the point that even he gets a bit curious throughout the anime. I'll just say it right now. Hyouka is one of the best mystery animes for me. The mysteries are enjoyable. The character interaction was great.The animation phenomenal. Whats more there to say. I would definitely recommend this to people who love romance and mysteries. No, scratch that. If you like anime.Then definitely give this anime a try. High school – It is probably not incorrect to suggest that this is the most ubiquitous setting for anime nowadays. Yet even amongst the endless swathes of high school anime that inevitably centre around cute high school girls, there are always exceptions and Hyouka is one of them. We find ourselves in the Classic Literature Club of which Oreki Houtarou, our energy-conserving protagonist is reluctantly a member and is soon joined by his eclectic group of friends, thus completing the groundwork for this “mystery” anime. When one considers what constitutes a “mystery” show, it is often associated with preconceptions of crime, horror and eerie suspense but Hyouka is not your typical mystery show as it centralises on mysteries of little real-life consequence. These aren't mysteries whose resolution will lead to justice being carried out but mysteries whose consequence lies in how it affects our characters. Nonetheless, Hyouka excels at executing these mysteries and in an atypical manner, with each of our main characters bringing a unique perspective in solving these mysteries, making the process fascinating as we observe the quirky and unpredictable methodologies being used. Hyouka does not have one unrealistically prodigious detective that can unravel and deconstruct even the most intricate of puzzles but a range of characters, some unique to each case, that all contribute key aspects leading to the solution. This makes for a more fulfilling and genuine resolution as you feel part of the process rather than a bystander in awe of some amazing detective. The solutions themselves are meticulously well-written and thus accurate and realistic yet simultaneously complex making you feel slightly more intelligent by the end of every one. Some may find the lack of ramification in the mysteries innately boring as the characters aren’t actually usually directly involved in them, for they act for their own various reasons but they at least create a desire for you to solve them. However, what makes Hyouka so enjoyable is not the satisfaction of decrypting it all but the development of our 4 main characters throughout each one. Hyouka is an exemplar of how the high school slice of life genre could be achieved as the relationships between our characters are captivating yet incredibly realistic with each action remaining true to the psyche of high schoolers and the ways they make decisions. The pacing is slow but constant and we can see a smooth progression in the development of our characters which tackle real-life issues that high schoolers face but nonetheless in a Hyouka-esque fashion, usually amongst the mysteries. Besides the hyperbolised curiosity of our female lead, the dialogue is extremely genuine and for me at least, indistinguishable from your real life conversations with friends at school. As the characters interact more with one another and face their problems, we are shown a vast array of emotions and considerable depth to their actions and motivations which are relevant, accurately portrayed and likely to be issues that you yourself may have faced. On the technical aspects, Kyoto Animation (Kyoani) must be lauded for how brilliantly Hyouka is presented. The atmosphere is prominently compelling with both the visuals and the sound contributing vastly in creating a well-constructed universe that entirely fits Hyouka’s quirkiness. The animation is also of the best I’ve seen – be it the expressions, movements or the background/setting -they are all smoothly animated with appropriate lighting and colour palette to fit the tone of each episode. Hyouka’s episodes are visually stunning to behold in particular when mysteries are being solved, as it involves the use of experimental animation that diverges completely from the usual crisp style to a tailor-made style suited for each different mystery. To top it off, complementing this is a fantastic soundtrack that consists of light instrumental pieces which further amplifies the ambience in each situation. The majority of the pieces share a "playful mystery" theme and whilst lacking in variety, the entire musical score is definitely a strong one that can instantly be identified as "Hyouka's OST" rather than forgettable music which lacks the identity of the show it aims to enhance. Ultimately, I feel Hyouka is an excellent anime. For me, it fell slightly short simply due to the sense of incompletion in the way the show ends. I say no more to avoid spoilers but if you do watch it you may find out. If you’re looking for a unique mystery or slice of life show whose fortes lie in its characterisation, production values and its take on the mystery aspect - this is one to watch. If you’re however looking for a serious mystery (à la Death Note) then this might not be for you as the satisfaction you receive derives from observing how these mysteries are solved rather than the fear of heavy consequences, and the impacts each one has on the development of our characters. Some anime attract an audience through heavy fanservice, others via an action-packed plot and others with a deep/profound plot. However, Hyouka is an anomaly. It shows us how even seemingly mundane things can be made fascinating. Whilst I obviously cannot guarantee you'll enjoy it, if you’re looking for a distinctly novel anime experience in either mystery or slice of life, then I’d wholeheartedly recommend Hyouka. Visiting a shrine to receive blessings for the new year is a key tradition for Japanese people of all ages. And the results may surprise you!